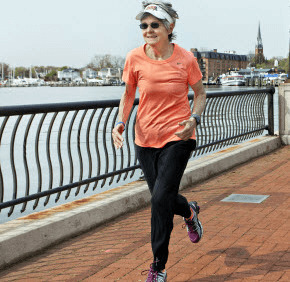 ANNAPOLIS – Molly Sherwood decided to train for her first marathon at age 64. She had always wanted to try one, she said, so she signed up with a training group that organized long runs on Saturdays. “I, of course, was the oldest one in it,” she said. A 26.2-mile race was a big reach, and she wasn’t sure she would actually make it to race day, she said. She surprised herself by running longer distances every week. She not only completed her first marathon – the Marine Corps Marathon in Washington, D.C. – she signed up for more, and now, at age 70, is training for her fifth marathon, which she expects to run in the fall. She has also completed about 15 triathlons and numerous shorter races, and has a swath of participation medals to prove it. Sherwood has always been active, she said, but her boost in athleticism corresponded with her retirement from a 45-year nursing career. In addition to running, she cycles, kayaks and attends weekly senior fitness classes. Her health care background helps her care for body, including in nutrition and injury recovery, she said. Sherwood her husband, Bob, live within walking distance of their parish, St. Mary in Annapolis. Every other day, she runs six to seven miles on a route that often takes her over the Maryland Route 450 bridge, around the capital city’s historic neighborhoods and through the grounds of the U.S. Naval Academy. In races, younger runners see her age marked on the back of her leg, and tell her they hope to be doing the same thing when they’re 70. The compliment makes her run a little faster, she said with a smile. There may be fewer people competing in her age group, but she expects a coming influx of baby boomers to change that. “There are more people in their late 50s or 60s who are fit; certainly more than there were 10 or 15 years ago, and certainly more than 20 years ago. It’s kind of a growing market,” she said. Sherwood’s best marathon time is four hours, 48 minutes, but she is aiming for 4:40 this year, she said. She thinks she could complete a marathon in 4:30. Her goal is qualify for the Boston Marathon, which is held every year on the third Monday in April. The qualifying time for her age group is five hours, but faster times are eligible for earlier registration and a better chance at a spot. “There have been great, fun things to pursue in retirement, and great fun things to learn and do, both physically and mentally. It’s really fun,” Sherwood said. Sherwood applies the same level of commitment to language studies as she does to running. After she retired, she took Spanish classes at Anne Arundel Community College and participated in two short-term immersion classes, one in Cuernavaca, Mexico, in 2010, and the other in Quito, Ecuador, in 2011. Now she teaches English as a Second Language in Annapolis, and is planning to teach a weeklong English class to Spanish-speaking professionals in Spain this summer – a trip she may pair with a jaunt on El Camino de Santiago, an ancient pilgrimage route. Sherwood is also a painter, and continues to work as a nurse volunteer at the Annapolis Outreach Stanton Center for uninsured patients. Even after years of working as a hospice nurse, Sherwood said never thought about how many years she has left until turning 70.